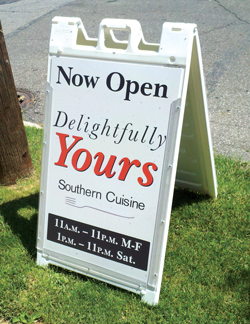 PVC signs are great for interior and temporary exterior use. 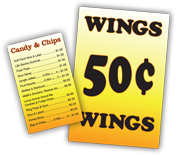 With 1/8" thickness and smooth surface these can be used as menu-board panels, on A-frame stands, in windows, as door signs and more. A-Frame PVC Signs Installed with "Fit Kit"
Plasticade Message Board EPS131MK with 300 letters and numbers plus "Sale" and "Special" headers. Works on 24 x 36, includes 2 boards, call for pricing. Real-estate frames for various size signs.